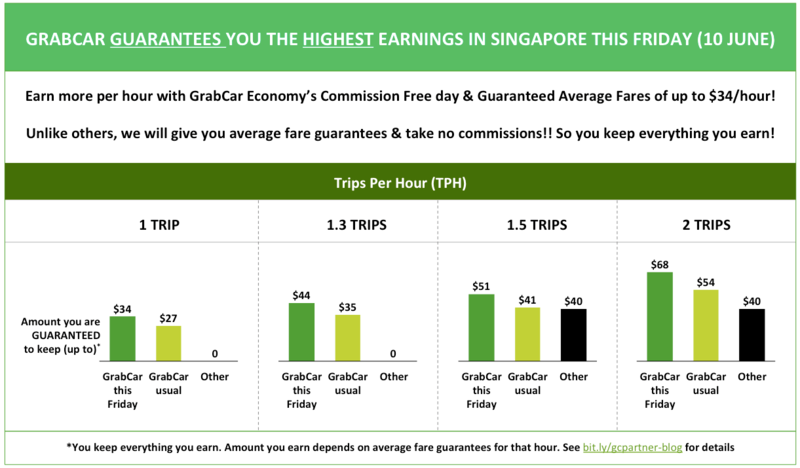 Dear GrabCar Partners, to thank you for your continued support & as our way of saying sorry for our system outage last Friday (3-June-2016), enjoy 0% commissions ALL DAY this Friday (10-June-2016) ON TOP of average fare guarantees of up to $34/trip! Commissions will be deducted as per normal and refunded to you together with your weekly incentives next week. Weekly AR/CR criteria applies. Happy Grabbing! 谢谢您的支持。我们对上周五（六月三日）晚上的服务中断深表歉意，因此这星期五（六月十日）您将享有全天 0% 佣金/ commissions （这不包过每趟高达$34的价格），重点是每周AR/CR条款依然有效。我们将照常扣处佣金，然后在下周连同每周的奖励同时付给您。每周AR/CR条款依然有效。祝您驾驶愉快!